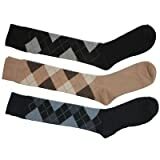 3 pairs of Mens Long Hose Knee High Socks. Argyle Design. Cotton Rich. Cotton Rich. Cotton for natural comfort. Reinforced heal and toe for extra durability. Lycra for the ultimate in fit and comfort. Soft Comfort Lycra for a soft gripping comfortable sock top. Shoe Size: UK 6-11 / EUR 39-45. Fibre Contents: 80% Cotton, 18% Polyamide, 2% Lycra Elastane.